(Bloomberg) -- Investors betting against this year’s second-worst performing currency are struggling to execute their trades. It’s now virtually impossible to short the Turkish currency as the cost of borrowing the lira rose to the highest level in nearly two decades, exceeding 300 percent at one point on Tuesday. The interest rate that foreign traders have to pay to hold the lira spiked after funds looking to exit their investments following the lira’s plunge on Friday faced a dearth of liquidity. 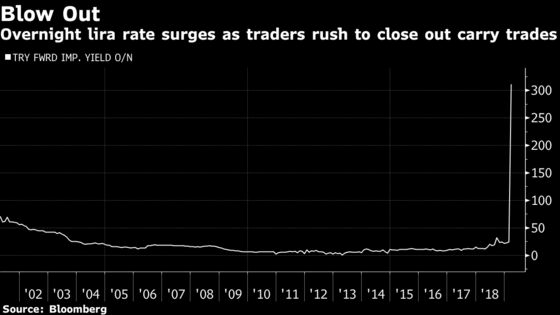 Some Turkish lenders hesitated to offer even the maximum liquidity to the offshore market allowed by the regulator -- a cap imposed at height of the market rout last summer to deter speculators. A chill descended on the financial sector in Turkey this week after authorities launched investigations into JPMorgan Chase & Co. and other unspecified banks for allegedly stoking Friday’s lira rout. President Recep Tayyip Erdogan warned on Sunday that bankers deemed responsible for speculating against the currency would be punished. That’s not a threat to be taken lightly in Turkey where Erdogan was sworn in with vast executive powers in an election last year. The president, who has a well known distaste for high borrowing costs, has in the past bashed Turkey’s central bank and commercial lenders for keeping lending costs excessively high. Erdogan’s stance on interest rates prevented the monetary authority from defending the currency for much of last year. A belated tightening in September after a round of heavy currency depreciation pushed Turkey into a recession during the last quarter of 2018, just before the president’s ruling party faces a crucial vote on March 31. The so-called overnight swap rate posted a more than 10-fold increase over the last two days to the highest since Turkey’s 2001 financial crisis. Offshore funds trying to close existing long lira positions are failing to find counterparties and, subsequently, driving up the rates, two people with direct knowledge of the matter said. The lira strengthened for a second day on Tuesday and gained as much as 1.4 percent before trimming its advance. It was trading 0.2 percent stronger at 5.5354 against the dollar at 4:01 p.m. in Istanbul.